Sabra’s artistic talent captures the history of the West and ranching on canvas, using knowledge acquired from growing up on a southwestern New Mexico ranch. Her early critics were the cowboys and old-timers who intimately knew the West and the animals in it. In her early years, she was discouraged from painting Western art in lieu of more modern subjects. 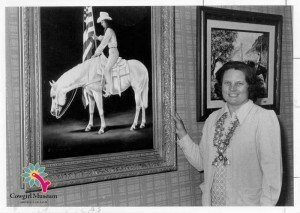 Through her desire to “paint it right,” Sabra’s art beautifully and faithfully portrayed Western life.